This is a guest blogpost by Gamil Jassin, a journalism Masters degree student at City, University of London. We all moan and groan about how bad the battery life on our phones is. Then, we keep moaning when Apple slows it down slightly to make the battery last longer. Pubs in the UK have stopped charging our phones, because they say “it is a security risk”, and wireless chargers are hard to find and aren’t themselves wireless which is, well, stupid. So, here are five quirky solutions to these problems in 2018. Anyway, before diverting into a rant about Donald Trump and plastic bottles, here is one way you can stay warm and simultaneously charge up your phone. It’s called the Torch 2.0 portable coat heater. It is designed to fit in the jacket of your choosing, and can be switched easily between jackets with the use of Velcro. It is powered using a 6000mAh power bank giving you up to four hours of warmth off a single charge. It also has two additional USB ports which are compatible with any smartphone. It is currently only available from the company’s US website, retailing at $99.99. Need to charge up your tech and reply to emails, but don’t want to be stuck in a noisy café at lunch? There is now a solution. 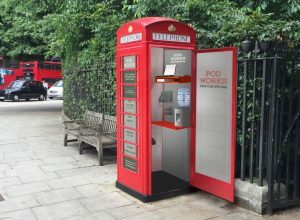 A New York-based co-working company, Bar Works recently transformed a number of the UK’s underused but iconic red public phone booths into micro-offices for workers on the go. The project was launched in London, Leeds, Plymouth and Edinburgh as a more private alternative to co-working spaces and cafe offices. The company retrofitted each phone box with Wi-Fi as well as a printer, scanner, wireless mouse, 25-inch screen, hot drinks machine and power outlets, all for £19.99 a month. However, it seems to be the case that the CEO of Bar Works is fact one Renwick Haddow, who previously ran the Capital Alternatives network of companies, which the High Court ruled in 2014 to be “collective investment schemes which could not be lawfully operated by the defendants”, according to the Financial Conduct Authority. There is also, reportedly, some doubt as to whether Jonathan Black is actually a person. We’ve all been there – desperately closing apps and lowering brightness in a futile effort to save battery power for the journey home after a night out. The simple plug-in disposable charger, PowerHit, which works with both Apple and most Android devices (Type C USB not currently supported), is being retailed at £3. The company claims that it can produce up to two extra hours of charge. Before you get your hopes up, it is important to note that your phone must be on for the charger to work and this isn’t disclosed by the manufacturer on either its website or the packaging. And more worryingly still, remember Donald Trump and plastic bottles? Add this one to the list of “ecological disasters”. So, you finally got your hands on the new iPhone X, but have now realised there isn’t enough space on your bedside table for a wireless charger. There’s no need to worry. Ikea and other manufacturers have worked hard in recent years to incorporate Qi charging technology into furniture and everyday items, such as a bedside lamp. As well as allowing you to charge your device wirelessly, it offers an additional USB port so you can charge several devices simultaneously. Ikea’s offering retails at £49. 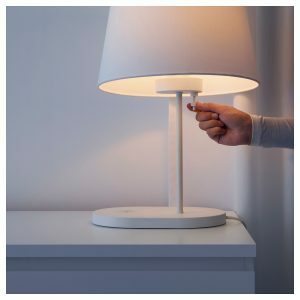 If you don’t have an iPhone X, but like the lamp, the retailer also sells Vitahult wireless charging covers which make your phone Qi charging compatible and should keep your phone from cracking in case you accidently knock it off your new bedside lamp. You didn’t buy a case for your phone. You’re running through the house one day, trip over the dog, fall and land right on your phone, smashing it to pieces. Fortunately, you wanted to get a new one anyway, one that doesn’t run out of charge in a few hours. This new offering from a Chinese phone manufacturer might be the one for you. The Oukitel K10000 is powered by a 10000mAh battery capable of going up to 21, yes 21 days on a single charge with moderate usage. The phone also allows you to charge other devices, even supporting some smaller laptops. It also sports a 5.5″ FHD Display, a fingerprint reader, dual-lens cameras (13MP+5MP), runs Android 7.0 and has other rather impressive specs and all from £165.99. It is however a little on the chunky side (it’s huge, actually) and Oukitel isn’t a very well-known brand, so there will be some obvious scepticism, but stop being snobs. And keep in mind that you can get five of these for the price of the iPhone X and still have money left over for an attachable coat heater, 10 disposable chargers, that beautiful wireless-charging lamp which you will not be able to use because your new phone/phones don’t support wireless charging, but who cares, and maybe even a month’s access to your own micro office, which you may have to wait a little while for. Stop moaning! Use a regular charger and plug it into a socket several times throughout the day like most normal people do.